The next entry in my series on minor holiday specials is “Casper’s First Christmas,” a 1979 half-hour special animated by Hanna-Barbera. This special crossed over Casper the Friendly Ghost with Yogi Bear, Huckleberry Hound, and several other classic Hanna-Barbera characters. The plot of this special sees Casper and a ghost friend of his, “Hairy Scary,” trying to save their otherwise-abandoned house from demolition. Yep, another Christmas special with a Christmas Eve-timed foreclosure deadline. 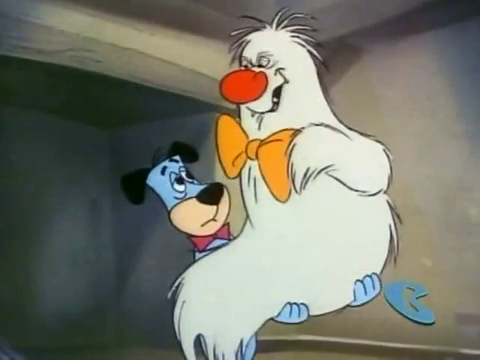 Hairy Scary’s a heavy-set bow-tie-wearing ghost with the same voice as earlier H-B creation Wally Gator. In turn, Wally’s voice was an imitation of old-time actor Ed Wynn. Meanwhile, Yogi and company get lost when driving to some sort of lodge. (The Jellystone Lodge from the following year’s “Yogi’s First Christmas?”) Figuring Santa will visit them wherever they spend the holiday, the gang decides to spend Christmas Eve in the first available house, which happens to be Casper’s. The gang set about sprucing the place up, which attracts the attention of Casper and Hairy. Casper does his traditional “greet someone, then sees them run off frightened” shtick. However, the gang warm up to the little guy. Much less so regarding Hairy, who’s determined to scare Yogi and company away. Eventually, Hairy has a change of heart, Santa makes his obligatory appearance, and everything is resolved at the end. 1980’s “Yogi’s First Christmas” reuses all of the songs from this special. One quirk of this special: during one song number, Quick Draw’s frightened by a realistic, non-sentient bear. Guess this must be the “average bear” that Yogi proclaims himself as smarter than… and apparently more sentient than, as well! For Yogi, this one is probably the weakest of his three Christmas specials. For Casper, however, this was indeed his “first Christmas” special. Casper would subsequently appear in 2000’s CGI animated “Casper’s Haunted Christmas.” Unlike “Casper’s First Christmas,” Casper’s regular supporting cast actually appear in “Haunted Christmas,” including the Ghostly Trio and Spooky, Casper’s scare-obsessed cousin with an old-time Brooklyn accent. Boomerang usually airs “Casper’s First Christmas” during December.